On 1st July 2010, just six weeks into his second tour in Afghanistan, Micky Yule stepped on an IED – which resulted in the loss of both of his legs…and of his career as a soldier. At a Whole School Assembly at the beginning of Remembrance Week, Micky spoke to Blue Coat about his experiences, and about the importance of Remembrance. “I spent 15 years in the military”, Micky says. “From a very early age, it was the only job I ever wanted to do…so it was very hard when I had to change my career. I didn’t want to, but I had to. I was a father, husband, best friend, and I had to get on with my life”. Having spent 10 days in a coma, eight weeks recovering in hospital and two and a half years having intensive rehab (and undergoing 46 operations), Micky tried to figure out what to do next. Micky is now a successful Paralympian powerlifter. He is currently bench pressing 190kg, and working on 200 kg, in preparation for Tokyo 2020. In 2016, he took gold at the Invictus Games…and he considers those games in particular to have been a “life changer”for him. “I went from not leaving the house and being scared of so many things – to getting out and competing”, Micky says. And he puts the success of the Games down to the leadership of Prince Harry, who did two tours in Afghanistan and subsequently started the Invictus Games for injured people who have been trained in the military. “He put his name on the tin”, Micky says, “and he still supports us. When he was on his honeymoon, he still turned up to help us at the Games in Sydney. That’s leadership”. Micky doesn’t regret his time in the Army and says he would swap all of his medals to spend “one day in Afghanistan with the lads”. “If the Army took amputees, I would sign up tomorrow. I would never have left”, he says. And it is for this reason, and because of his own experiences, that he speaks publicly about the importance of Remembrance. Micky spoke about how World War I – the Great War – was a global war and affected everyone. The war ended at 11:11 on 11th November and was known as Armistice Day; but, in 1919, came to be known as Remembrance Day, which commemorates those in the military who risked their lives in the past and the present, so that we might have a future. He also talked about the poppies that continued to grow in Flanders Field “amongst the hell” of war, and how they came to represent those veterans. “Think about how you would like to remember those people that died”, Micky says. “It doesn’t matter how you remember them, but remember them in some way”. Micky encouraged the school community to buy poppies as the sales go to help the veterans and their family and friends. During a Q&A session after the talk, Micky revealed that he is inspired by two 18-year-olds who lost their legs during their first tour of Afghanistan “and they would walk and never whinge”, he says. “They wanted to get out and go down to the pub with their mates. Their injuries were worse than mine and they really inspired me”. 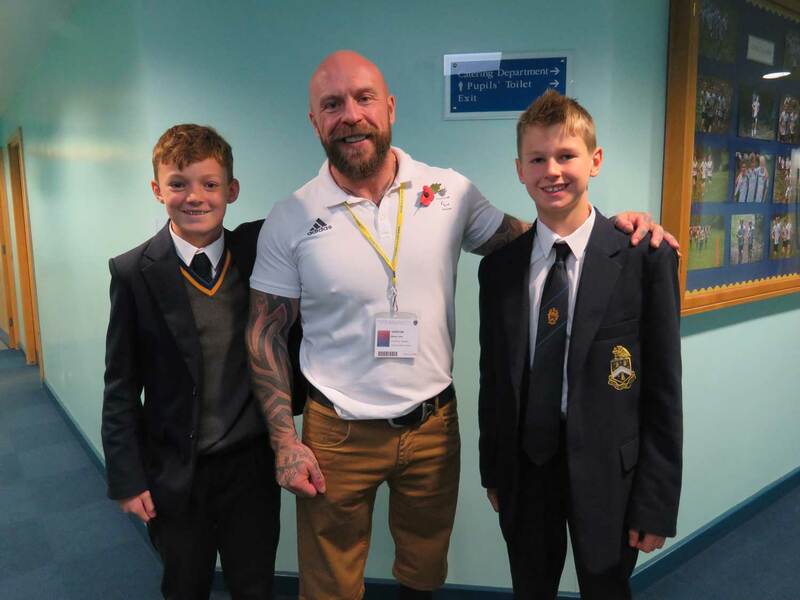 Micky’s positive attitude and his ability to move past some of the greatest challenges anybody can face, was truly inspiring to all of the students and staff attending his talk – and the line of students waiting to have their photo taken with this remarkable man was testament to that.